Well this semester i am taking two library science courses and one of them seems like it will give me a run for my money. I have to do group work and I am truly a person who works in the 15th hour so I am already struggling meeting with the group......is December near? I have finally sent some quilts off to be quilted so looks like more of my family members will get a nice gift before 2010. Two will truly be surprised as they are not expecting one from me. One is expecing one but it won't look like she probably is imagining it. I am also making myself two 50th Birthday quilts. One will be made up of thoughts from family and friends and the other will be my choice. 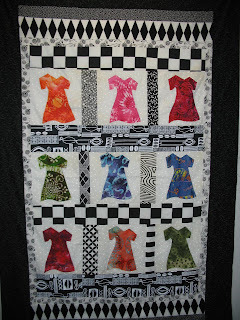 Had to laugh at this dress block quilt. I JUST purchased such a dress style on QVC!